Sweating it out in the Temples | Hello Cool World! 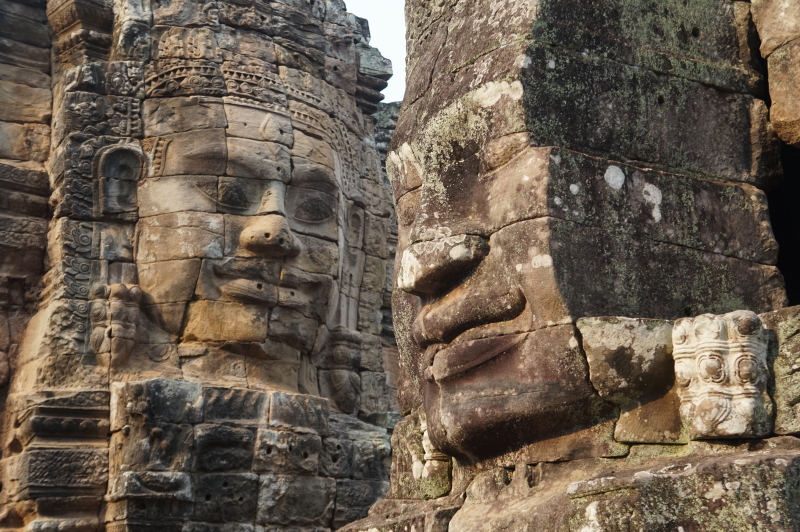 From 802 AD to 1432, Angkor was the locus of control; at the height of its power, over one million people would have called it home. Houses and public buildings were built of wood, and so have long ago disappeared. However, temples that were built for the gods were constructed of brick and stone, and so have withstood, to some extent, the ravages of time. 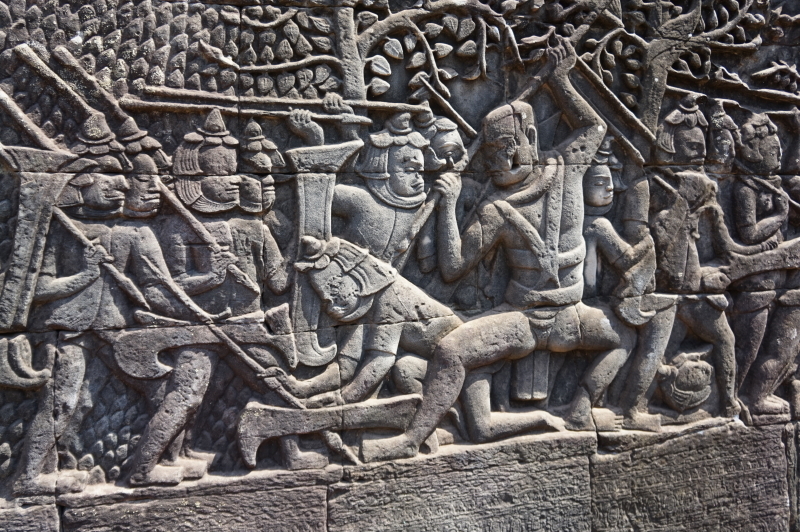 Numerous kings ruled the Khmer empire over its 600 year period, beginning with Jayavarman II (802 -850 AD), who brought numerous competing kingdoms together. 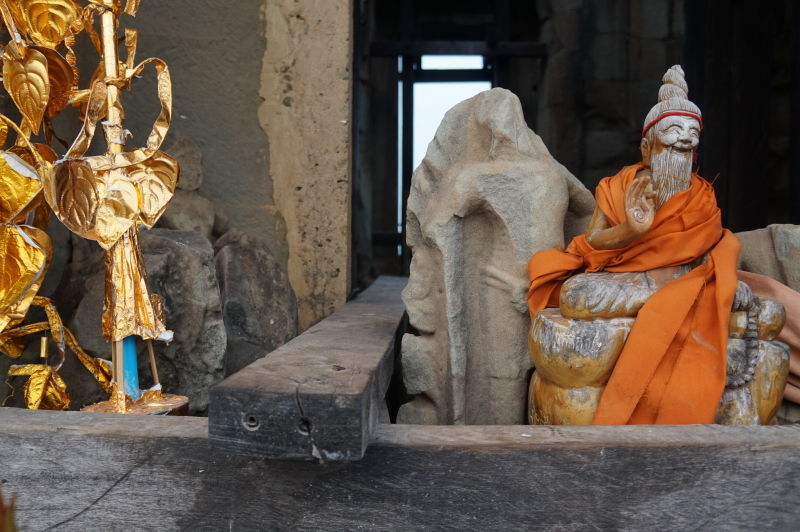 Proclaiming himself a devaraja, or god-king, Jayavarman II built a temple that represented Mt. Meru, the dwelling place of the Hindu god, Shiva. Following from this precedent, each subsequent king was expected to dedicate a temple to his patron god (usually Shiva or Vishnu). Temples were also constructed in honour of one’s ancestors (mothers, fathers, grandparents, etc.). As well, temples and mausoleums were also built specifically for the kings and were designed to reflect their power. Based on the enduring principle that “bigger is better”, many tried to outdo their predecessors in terms of the grandeur of construction. 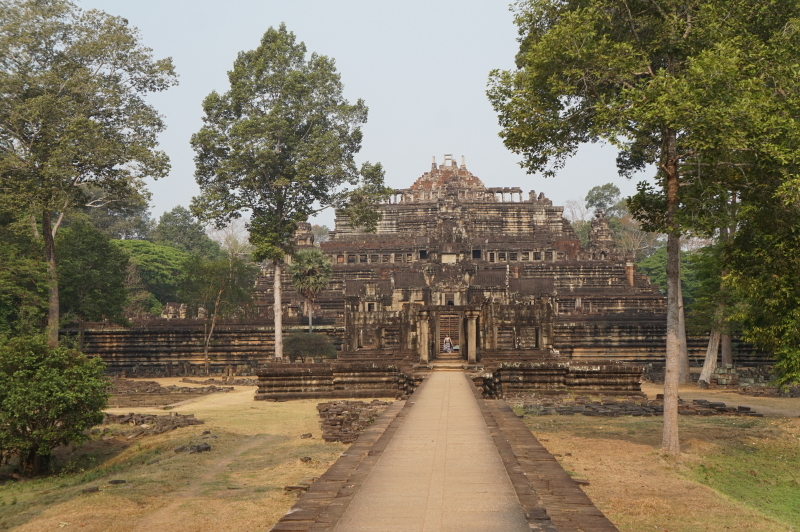 While most of the temples in the area were built to worship Hindu gods, toward the end of the empire one of the kings (Jayavarman VII) adopted Mahayana Buddhism. 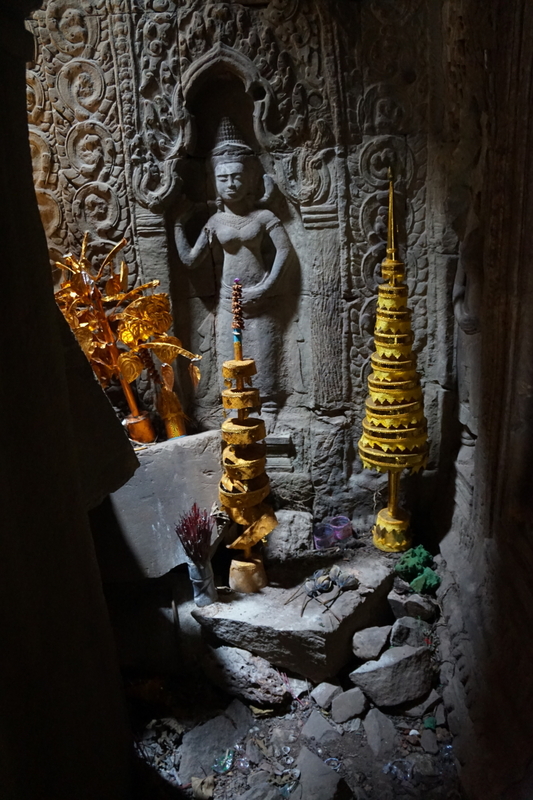 Unfortunately, during this period many of the Hindu carvings were destroyed and replaced by Buddhist imagery. It was under the reign of Suryavarman II (1112-1152 AD) that Angkor Wat – the world’s largest religious building – was constructed. Enormous in size and surrounded entirely by a moat which measures 1.5 km long, 1.3 km wide, and 190 metres wide, the sheer audacity that went into its construction is hard to imagine. Its construction apparently required 300,000 workers and 6,000 elephants, and yet it was still not fully completed. 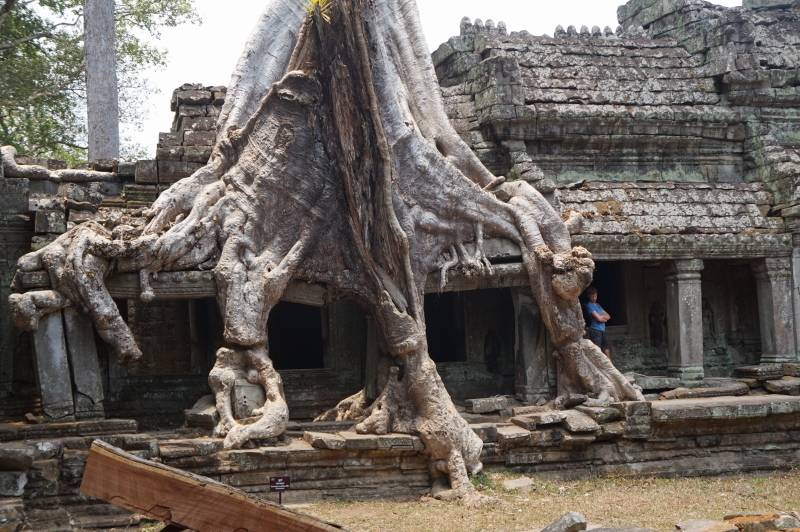 Each of the sandstone blocks that were used were quarried over 50 km away and then floated down the Siem Reap River on rafts. 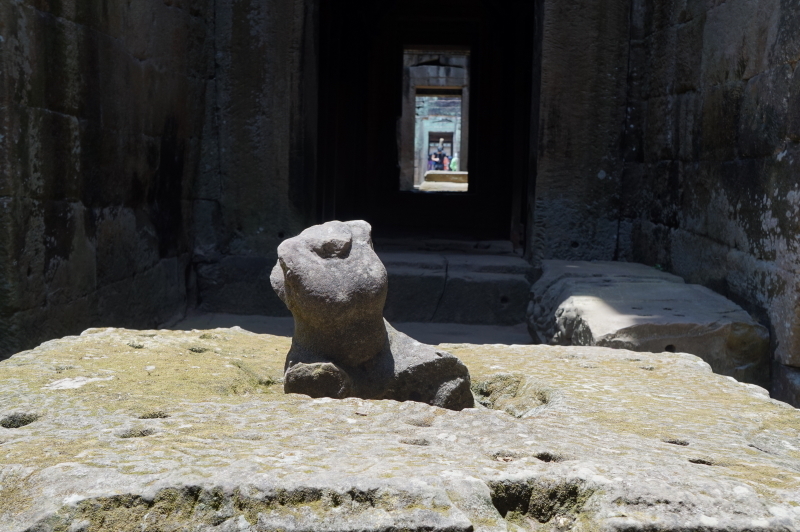 Along with temples, the ancient Khmers were masters at constructing waterworks and irrigation systems; numerous reservoirs were built to support the growing population. Over time, however, it is believed that these began to silt up due to overpopulation and deforestation. 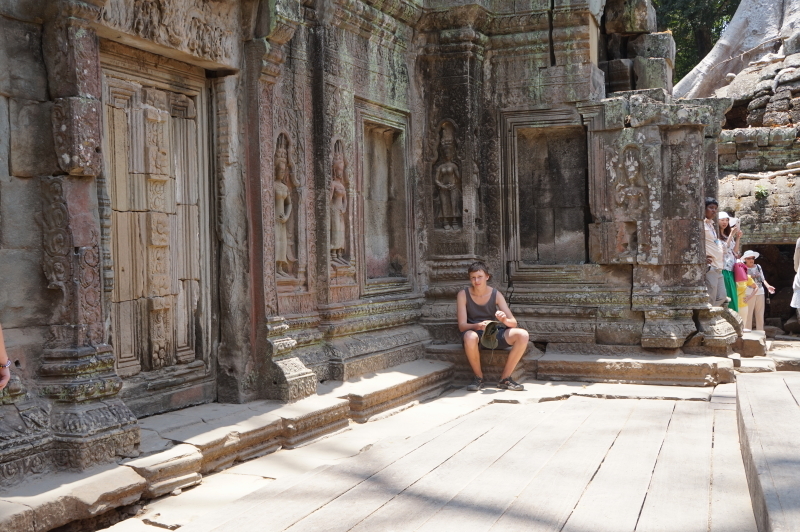 There is a mind numbing number of temples to visit and explore around Siem Reap. Fortunately, one can purchase a three-day pass that allows visitors to explore at a somewhat more leisurely pace – although there is so much to see it is difficult to choose. Nevertheless, we managed to see all the major temples, with a couple smaller ones thrown in. The secret to visiting is to get there early, before the heat of the day really kicks in – something that we failed to do the first day. 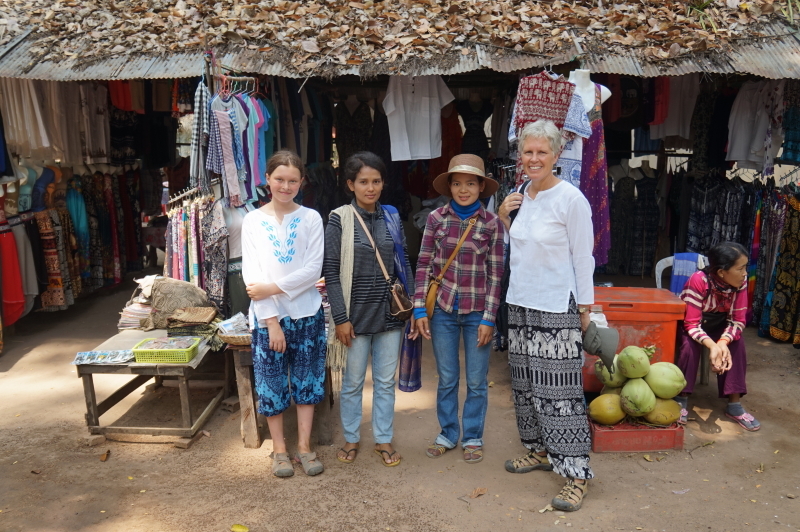 We had agreed to meet some friends that we had met in Thailand, however we were running late and so missed our meeting time. 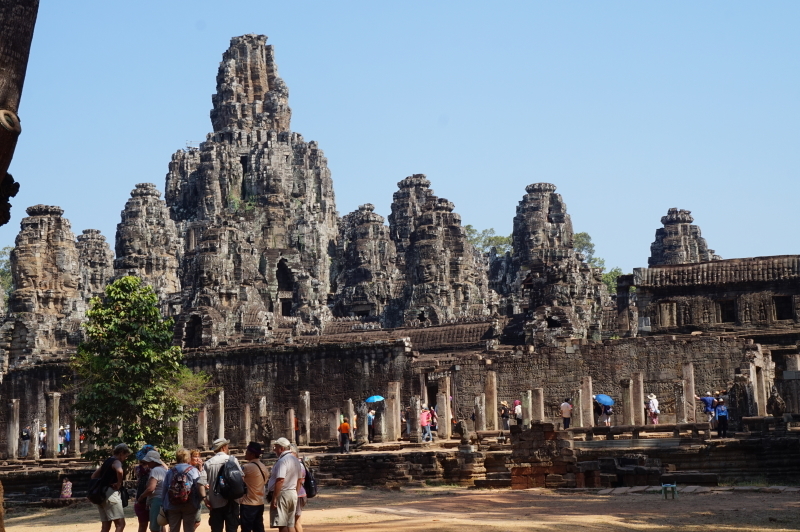 Fortunately we found them just entering Bayon, one of the most recognized temples within the area. 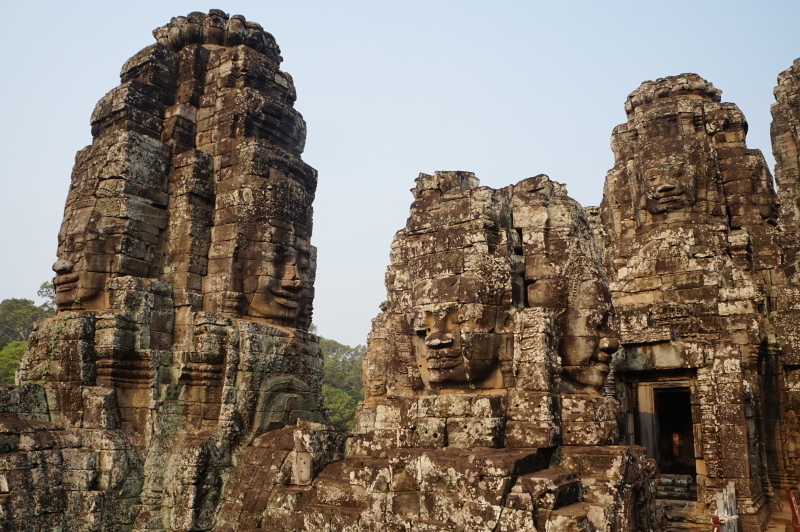 Built by Jayavarman VII (and therefore toward the end of the Khmer empire), the temple is famous for the 216 faces that stare off across the jungle. 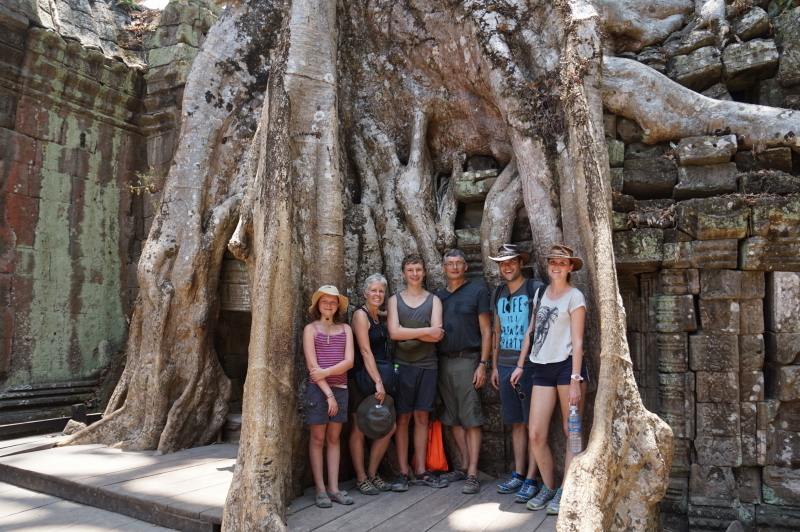 Our friends had hired a guide so we hooked in and continued the tour to several other temples, including the area around the city of Angkor Thom and the temple of Ta Prohm. 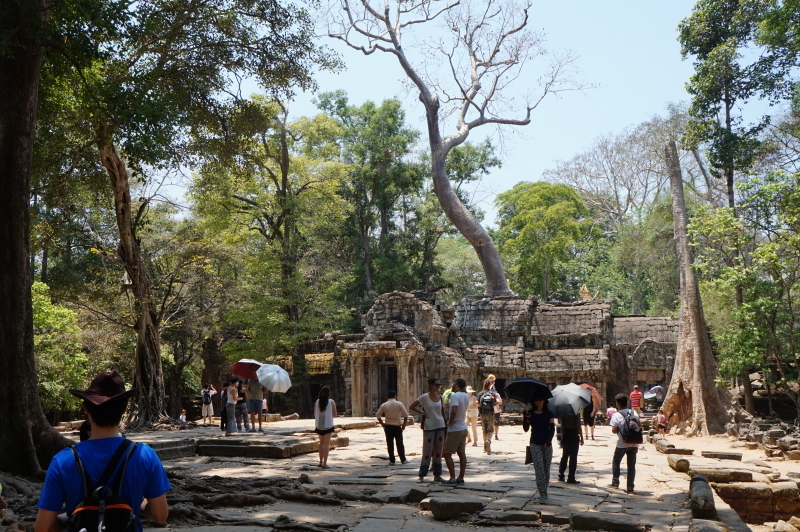 The latter was built in 1186 and was a Buddhist temple dedicated to the mother of Jayavarman VII. Over time it has been swallowed up by the jungle (and left like that) and is incredibly atmospheric – even with the hundreds of others who were wandering around it at the same time. 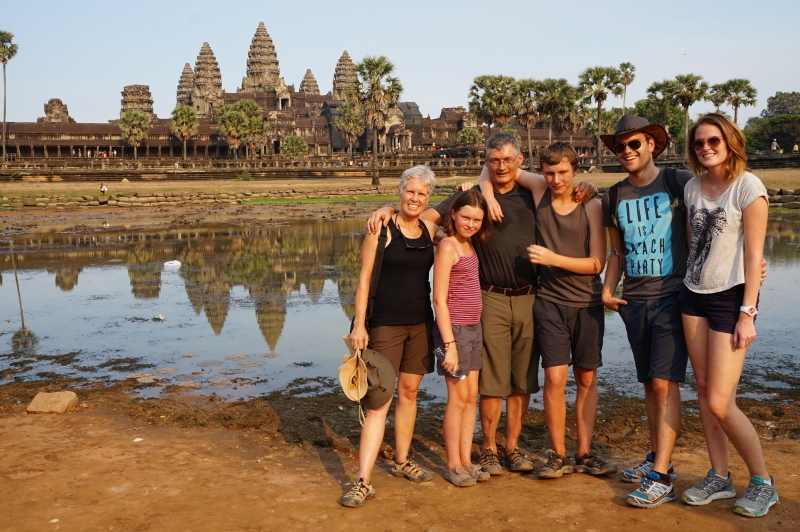 It was a really hot day, and so by the time we hit Angkor Wat later that afternoon, we poked around a bit but were basically done. Fortunately we had two days left. 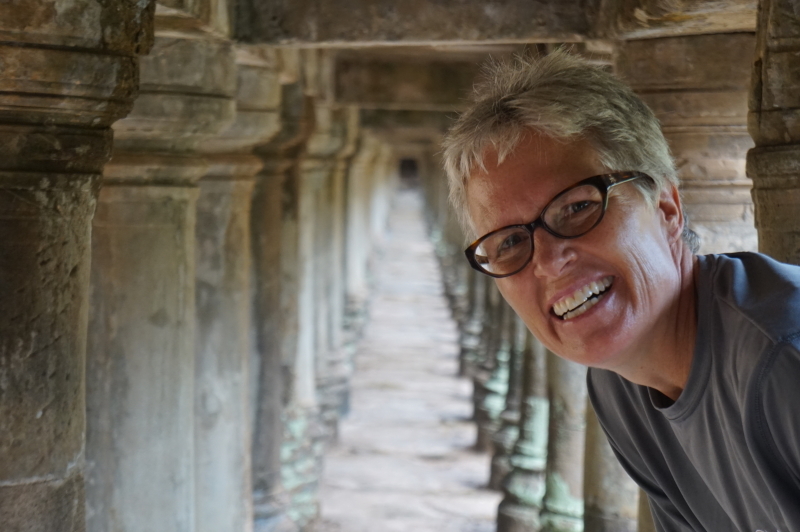 Our second temple day was when we headed off to see the temple of Banteay Srei, along with the landmine museum and butterfly centre – as described by Chris in A Day in the Life. 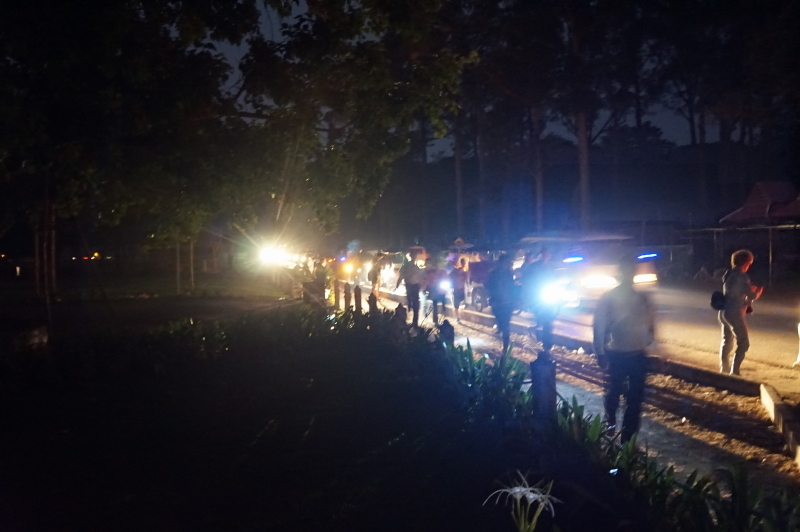 Our final temple run saw us up at 4:45 a.m. for a 5:00 tuk tuk ride. 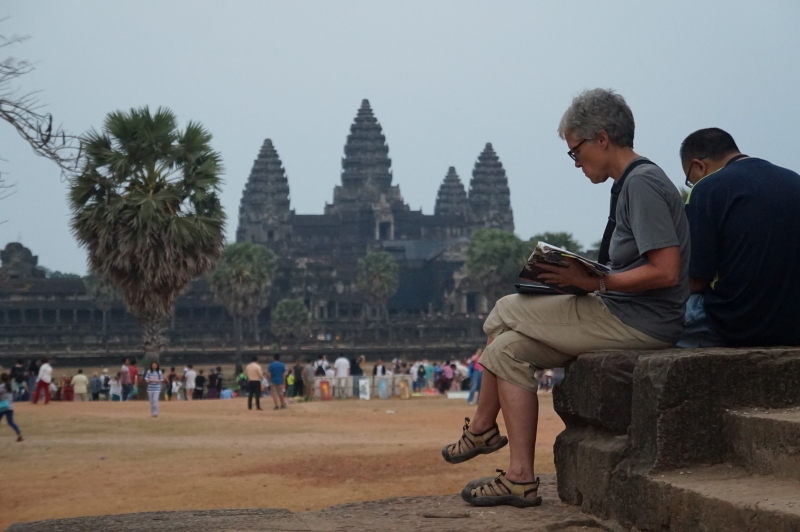 We were off to see the obligatory sunrise over Angkor Wat. As we watched, it gradually became obvious that the clouds were not co-operating. 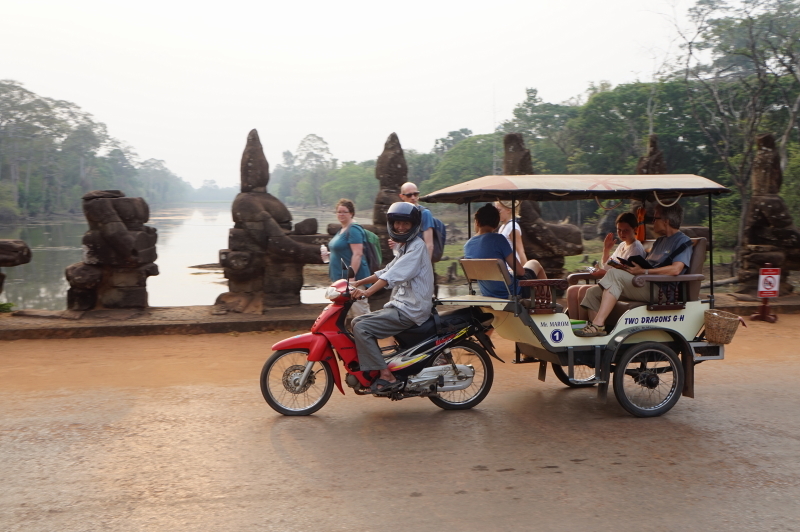 So, before the rest of the hoardes figured it out, we jumped in our tuk tuk and headed off to Bayon to explore it in relative peace and calm. 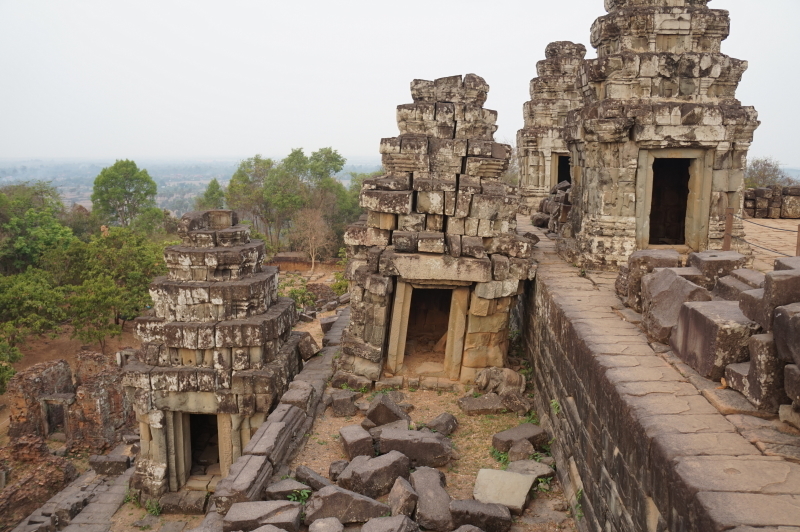 On the way to Bayon, we stopped to hike up a hill to Phnom Bakheng, where we were granted a belated sunrise. 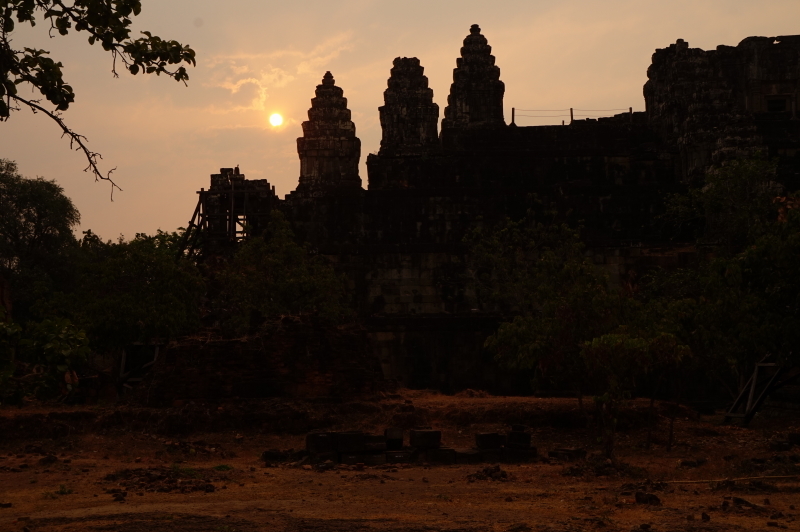 You can see the sun just rising above the bank of clouds that obscured the sunrise at Angkor Wat. 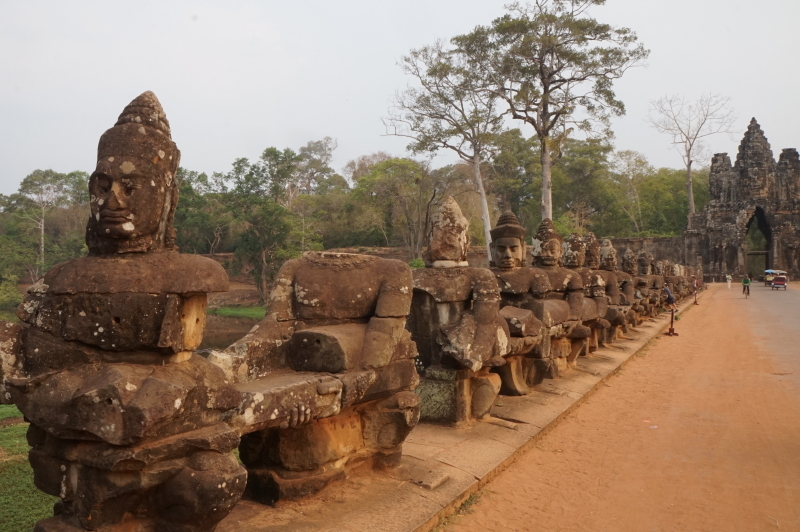 On to Bayon, across the bridge with statues representing the Hindu story of the Churning of the Ocean of Milk. The story is of the ever-continuing tug of war between the gods and demons; the serpent Vasuki serves as the rope. 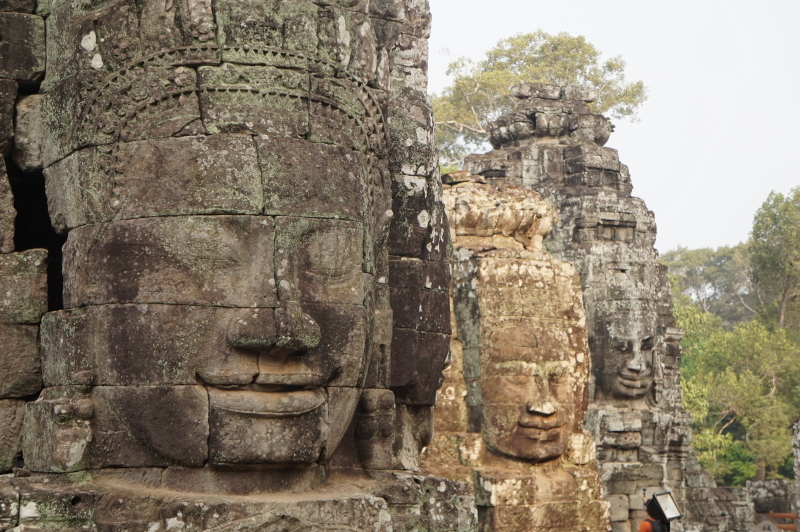 Not only is Bayon famous for the numerous faces, it also has some of the most extensive bas-relief carvings. Given that our guide had somewhat rushed us past these the first day, I was determined to try and make sense of the scenes depicted. 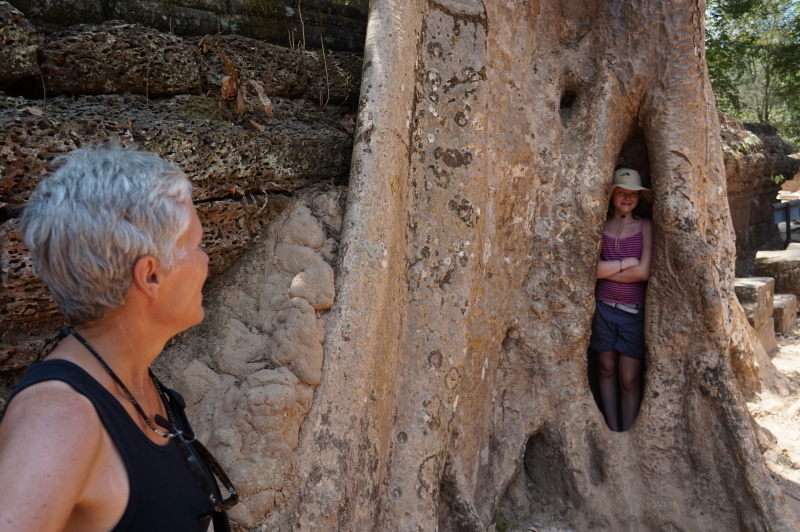 With our trusty Lonely Planet guide book in hand, we struggled to identify the first few carvings. All of a sudden, Eva excitedly pointed out the Brahmans being chased up a tree by two tigers (as described) and we were away to the races. Now we knew both the scale of the images to look for, as well as how far apart they were. Aran perked up and we continued on to successfully find all the carvings outlined in the book. Nothing like a good treasure hunt to re-engage everyone! 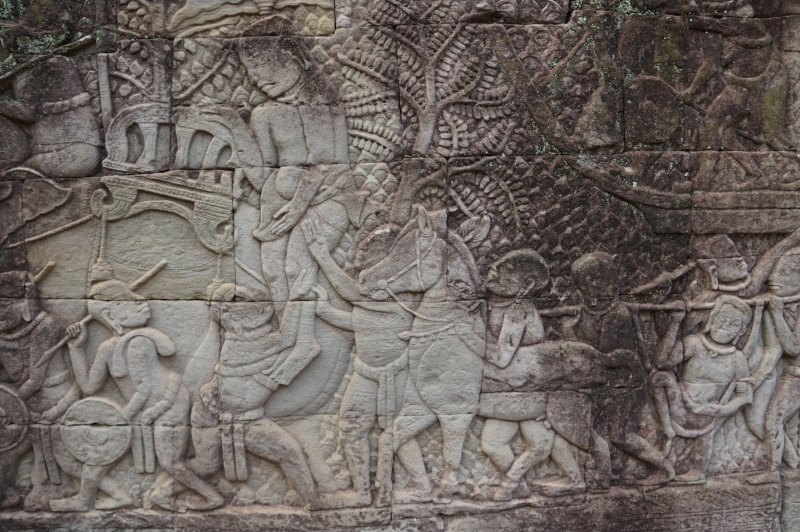 The injured king is being helped down from his elephant, while the general is being carried in a hammock behind. Eva and I buy elephant pants – they are literally so cool! 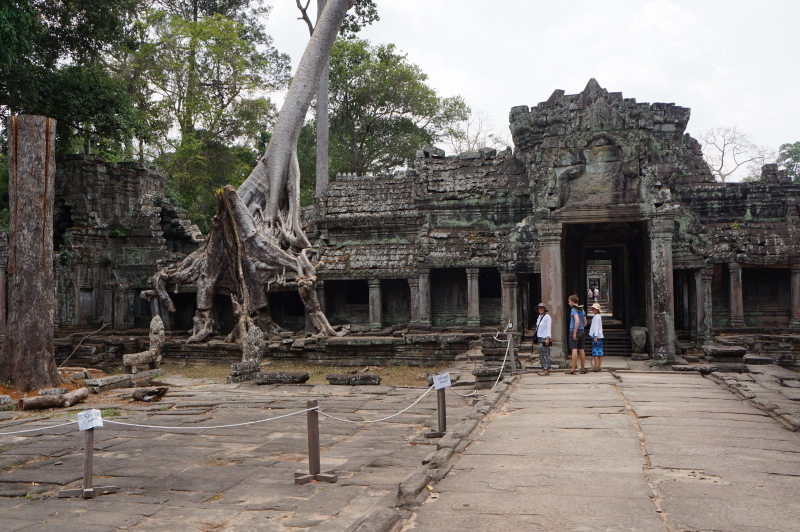 Our final temple was Preah Kahn, an immense temple which is a bit distant from the main collection. 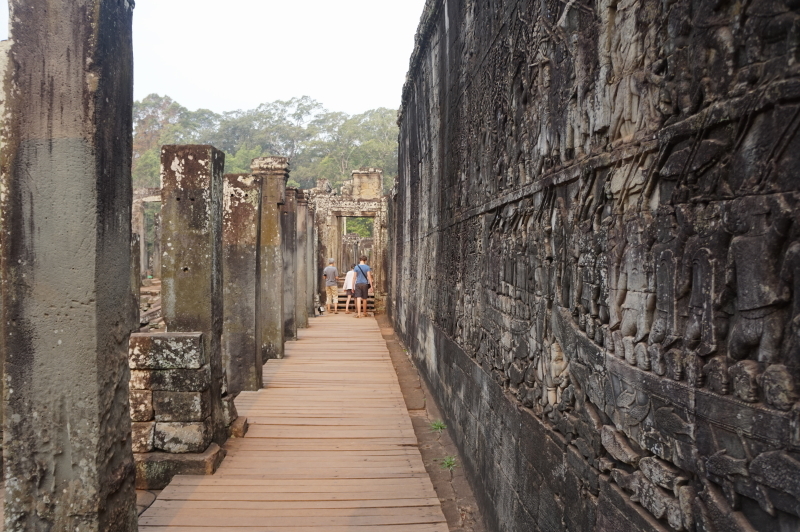 A maze of vaulted corridors and exquisite carvings, it was built by Jayavarman VII in 1191 and was dedicated to 515 gods. Each year, 18 major festivals would be held here. It must have been a spectacular sight. As we stood among the ruins, we tried to imagine just how it would have looked in its heyday. Made us all wonder what ruins future generations will find once we are long gone.